Posted on Jan.6, 2013 by Barry Bookmark the Permalink. 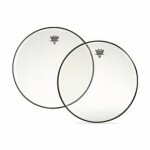 Remo Ambassador heads are the most popular drum heads in the world. They are warm, medium weight,single ply. With an open, bright and resonant sound they are excellent for live and recording situations. Our experience has shown a lot of players using coated on the top and clear heads on the bottom for superior resonance. Remo developed a special Fiberskyn head to use with Mid-East Metal Doumbeks. 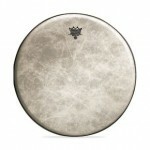 The head has a deeper collar than a normal drum head and thus accommodates the rounded shell of the drum. These are very warm and resonant sounding with a nice low bass tone when needed. The Fiberskyn Ambassador 3 is a medium weight head made of poly-spun fiber. Best applications are Jazz and Orchestral situations. It has a warm attack and mid-range resonance. A thin, single ply head with a textured impregnated surface. 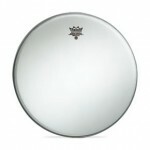 The Remo Renaissance Diplomat snare drum head has a very warm, resonant sound and is excellent for brush playing. Good for Jazz and Concert use. The Clear Ambassador head is a medium weight, warm sounding head. Often used on the bottom of toms for a resonant head, they are extremely popular in recording situations and live when being miked. They are a single ply construction. Used by many players in the recording studio as a batter(top) head. Based on the original drum head Remo manufactured in 1957 as an alternative to calf skin heads,the Vintage A head is a thin 2 ply . It is very warm sounding and has been popular with jazz and country players alike. A medium weight warm, resonant head. 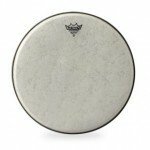 The Renaissance Ambassador is a single ply and an ideal acoustic sounding drum head. Very good for brush playing as well as sticks and mallets. Clear single ply medium weight head with a center dot on top. It is an ideal choice for "heavy hitters". The center dot provides durability and tonal focus. A medium weight coated head with a dot on the bottom of the head, The coated CS is primarily used as a snare batter and is ideal for heavy hitting as well as brush playing. It is a very durable head with the center dot providing tonal focus. The Skyntone is a medium fused poly spun fiber head with a natural skin look and feel. It is a snare batter head ideally for Jazz. It has an excellent brush playing surface with a warm, calf-like sound. The head is also a favorite of Orchestral players. The Snare Diplomat is a thinner bottom snare drum head than the ambassador. It is an ideal head for wood shell drums when sensitivity is important. A very popular bottom head for Concert snare drums. An excellent bass drum head for Concert and Jazz, the Renaissance has a warm, acoustic tone which fits in well in ensemble playing. Medium weight. A medium weight head with a dot on the beater surface. For many years the preference of Rock players, due to the ability to hold up to heavy hitting. The dot helps eliminate over ring at certain pitches. The Fiberskyn Ambassador has the appearance of calf skin and additionally has an extremely warm tone. 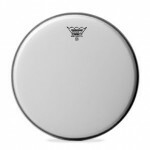 It is preferred by many Jazz players as a great acoustical playing drum head. It is the choice of many Concert bass drum players. 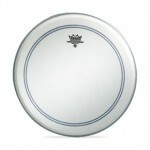 The coated Emperor is a heavy weighted, double ply head. It is the brightest sounding 2 ply head. It has been a popular choice with Rock players for many years. 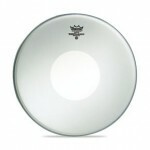 The Clear Emperor is a heavy double ply head with a bright attack and a projecting resonance. It has been a popular Rock head and a favorite in recording and live performance. A single ply, coated thin head, the Diplomat is often used in situations where articulation is a major concern. Not necessarily a projection-style head, it is more useful in delicate situations and an excellent head for certain types of recording or close miking projects. A very thin single ply head, the Clear Diplomat is most often used as a bottom head with a heavier weighted head on the top of the drum. It is an articulate head and useful for small room or close miking situations. 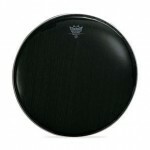 A medium weight single ply head, the Ebony Ambassador is open, resonant and warm sounding. It has attack and used for top and bottom heads. Because of the black mylar it is a little thicker than a normal ambassador weight. A coated double ply head with an outer edge that dampens the high overtones and produces a warm resonant sound. Ideal for "fat" sounds of Pop, Rock and R & B. Low pitch and warm sounding. Thicker than the clear pinstripe. A double ply clear head used often for a "fat" sound in Pop and Rock. Its outer layer muffles the high overtones and creates a warm low pitch effect. Thinner than the coated version. A black double ply head with a quick decay. Much like the clear pinstripe with an outer layer, but thicker. The Ebony Pinstripe is a great head for Rock and R & B. It has moderate attach and in a large setting, better miked for projection. It has a warm, low pitched effect. The Ebony Ambassador is a single ply,medium weight head. It is black and has a warm, open sound. Often used as a batter head and resonant as well. Thicker than the regular ambassador. A thinner head than the Fiberskyn Ambassador with similar characteristics. Warm sounding, poly-spun fiber surface. Ideal for Jazz and Orchestral situations. Ideal head for heavy hitting Rock playing. The Emperor X has a warm tone with a dot on the bottom of the head. It is the thickest of drumset heads with 2 thick plies. Used as a snare drum batter head. The Ambassador Hazy head is a medium weight bottom head for snare drums. 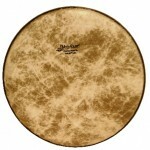 It is a warm, responsive single ply head. The most popular of all bottom snare heads. The thickest in the series of snare drum bottom heads. It is good for extreme heavy playing, but generally less articulate. One of the most popular marching heads in the world, the White Max has a reinforced counterhoop combined with an extremely durable fiber weave head. The tone produced, when properly tuned, has a very bright quality. 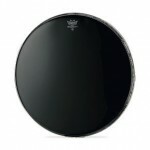 The Black Max is one of the most popular marching snare drum heads in the world. It is made from a fiber weave and has a reinforced counterhoop. It produces a very bright tone. The head is extremely durable and articulate. A single ply medium weight head, the Coated Ambassador is one of the most popular bass drum heads in live and and recording performance. it has a bright tone and very versatile. The Clear Ambassador bass head is often used as a resonant head and most popular because of its medium single ply weight. It is a versatile all around head. The Emperor is a double ply head and often used for heavier hitting. Not as bright sounding as the Ambassador, however it does have excellent projection. A double ply heavy weight head, the Emperor is very versatile and popular with many Rock players. 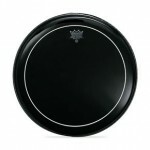 The Ebony Ambassador is the most popular front bass drum head made. 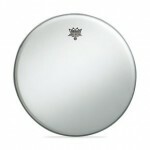 Leading drum manufacturers often choose this head to put on their drum kits with a logo. 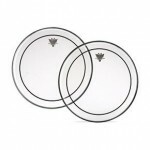 It is medium weight and because of the appearance, very attractive on bass drums. A black head with an outer ring. 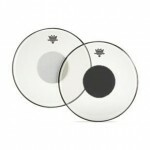 Medium weight, the Ebony Pinstripe is double ply and an attractive front bass drum head. 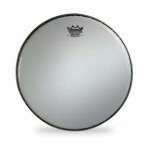 The Clear Remo Bass Pinstripe double ply head is very popular with players in Fusion, Rock, R&B, and Pop style bands. 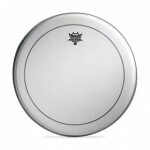 It has an outer ring which muffles high frequency overtones creating a warmer sound. 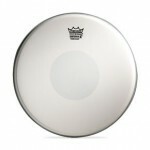 An extremely popular bass drum head which gained popularity as soon as it was released. A double ply head which creates a low pitch tone desirable in Rock, Pop, and R&B. The underlay on the outer surface prevents unwanted overtones. A popular head for Rock, Pop, Gospel because of the underlay ring preventing unwanted tones. it has a deep bottom tone and has become the choice for many hard hitting players.